It was a bleak moment in the early morning of October 3rd when Winship's Executive Director, Wally Curran, had to call off the Winship 5K. But even without the race, fundraising from this year's event surpassed its goal and is enabling research that will give hope to cancer patients in the years to come. Curran is gratified that the race to cure cancer could not be sidelined by weather. Curran proposed the 5K run/walk event in 2011 and word spread fast that this was a 5K unlike all the others. Since then, the number of participants has doubled and fundraising totals have more than tripled. And it all started because of Curran's passion for running, and for curing cancer. He shares five reasons why he runs every year. 1. Because I love it and I don't know any better. I started running regularly as a child and haven't stopped since. The Winship 5K fits my interests and my own compulsive behavior. 2. We need to walk the talk. Cancer prevention is a vital part of Winship's mission, and a healthy diet and an active lifestyle are critical parts of any cancer prevention routine. Hosting a fitness-oriented event is right in line with that goal. 3. Great things come from giving back. 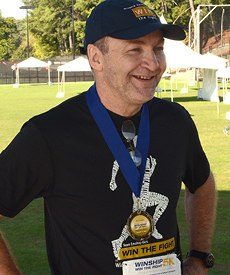 The money raised through the Winship 5K supports research across almost every cancer subtype. Whether you're mainly interested in helping to find cures for myeloma, melanoma or another type of cancer, we are able to direct donations to specific areas of interest and need. 4. Investing in our future. Winship 5k funds are used in part to fund the research activities of young and mid-career scientists. Some of their laboratory work may be too fundamental, too novel or too outrageous to be funded by the National Cancer Institute or the American Cancer Society at this time. Winship is confident that some of this work will lead to meaningful discoveries in the near term. 5. You'll get a great return on your investment. Winship is aggressively supporting the development of new cancer-related technologies. This year alone, we've committed over $1.5 million in pilot grant money to our "Winship Invest$" initiatives. We have a long list of projects to fund and every donation matters.